We are launching our grassroots Campaign to Win in Southern California on September 19th. To Win, we need to start NOW, line up our grassroots troops, get the attention of the candidates BEFORE the November 6th election, and be in FULL force when we introduce our bill in the New Year when we need to be ready to get 2/3rds of the Senate and Assembly, as well as the Governor’s signature. We all know how much revenue we have lost. It is time to work together for a Permanent Source of Funding for affordable housing! 100% of the Democratic Senators voted YES in May of 2012 so we know we can bring home the win with more work, more training and a fully resourced campaign. Take the 1st step to win ½ billion dollars annually! Enter the building through the alley way behind it (not from Flower) to reach the Community Center Room. There is a $5 parking lot on the SE corner of Olympic & Flower (the alley entrance to the Community Room is off the SE corner of the lot). In case that lot fills up, there are other lots further south on Flower, on either side of El Cholo restaurant, as well as one on Hope Street, just south of Olympic. 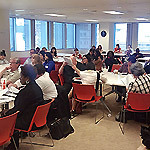 Who: Lisa Payne, SCANPH, Policy Director, and Shawn Rowland, Housing California Campaign Consultant, will Co-lead the training. Why? We need a permanent source of funding for affordable homes. We will all have to work together if we want to WIN. We would like each developer to send at least one staff representative. If you can only send one person, please send your “top brass” who can make decisions about how the organization can engage in the campaign. Learn about the overall Campaign to Win strategy. Identify your role in winning ½ billion dollars of annual funding to provide homes for the hardworking families, veterans, homeless individuals and people with disabilities. Find out what we can do to take advantage of the Presidential election to help us get the 2/3rds vote and the Governor’s signature on our bill. Effectively speaking about the California Homes and Jobs Act to Legislators. Strategies to engage staff and residents. Non-profit developer’s staff and/or residents who will be actively involved in the campaign regardless of their role (politically active, site staff who will be engaging residents, engaged in the last campaign, will be assigned to the campaign). Service providers who work with affordable housing developers. For profit developers who will be engaging in grassroots organizing. Anyone who wants to work with us to get a permanent source of funding for affordable homes in California. We need to know who is coming to make our training suited to you. Please RSVP here by next Thursday, Sept. 13th.